This is not really Elias's tree, of course. It's not even Elias and Company's tree. It's merely outside of it. But you can see Buena Vista Street's department store in the background. I really love this tree on Buena Vista Street. It's an oversized version of something you'd find at home, complete with all the presents and goodies underneath. And all the ornaments are classic and harkening to another era... it just sends warm Christmas fuzzies all over. So has DCA done Christmas right? If you haven't been paying attention to this month's blog posts: yes. They've done it right. 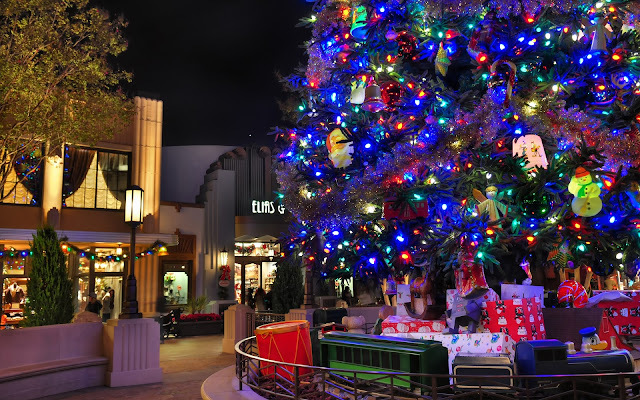 The Buena Vista Street Christmas tree, outside Elias and Company.